A church in Winston-Salem is ending its partnership with the Boy Scouts of America after more than 60 years. A church in Winston-Salem is ending its partnership with the Boy Scouts of America after more than 60 years. Earlier this week leaders at Calvary Baptist Church released a video announcing the decision. The National organization announced this spring it would remove a restriction denying membership to youths based on sexual orientation. Calvary Baptist is part of the Old Hickory Council, which covers eight counties in the state. It is not the first church to end a chartered partnership. “We know, I’m going to say three to five right now, some are still in the process of deliberations right now; but three to five out of 135 or so charter organizations who are, or may be ending their relationship with scouting,” said Steve Wilburn, Scout Executive for the Old Hickory Council, which includes eight counties. Leaders from the church declined to do a recorded interview. “We’ve been uh, well we’ve just been good partners over time. We certainly respect their right to make a decision on their own beliefs as they see fit,” Wilburn added. Nationally the Boy Scouts of America has seen about a three percent drop in partnership. Calvary Baptist had 135 members in its scouting program. Rodney Carpenter is another scout executive who declined to go on tape. He estimated that nine churches have dropped their partnerships in the Greensboro area. Calls to scout leaders in the Triangle were not returned. Nationwide the scouts have seen a drop of about three percent in charter partners. 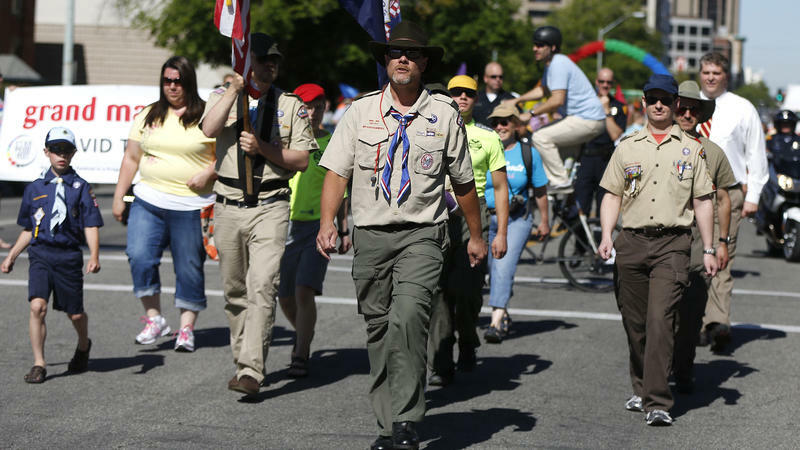 Ten days after their national organization voted to allow openly gay boys to be members, a handful of Boy Scouts marched in uniform on Sunday at the Utah Pride Parade in Salt Lake City.